Here’s some shocking statistics: According to the World Health Organization, nearly two-thirds of all deaths occur due to non-communicable diseases (NCDs) which contribute to more than 60 percent of deaths worldwide. Over the coming decade, some 388 million worldwide will die of one or more chronic illnesses and the cumulative losses in global economic output due to NCDs will total $47 trillion by 2030. But before you go jump off a tall building, some new solutions developed by university teams could soon be harnessed to help manage the glowing global problem of such NCDs like asthma, diabetes, stroke, and cancer. As part of the NCD Challenge, sponsored by IBM and pharmaceutical maker Novartis, a global competition was held to bring together industry and academia to create innovative, easy-to-use solutions that help fight the human and social burden of NCDs. Like a social-media enabled support system for pregnant women with gestational diabetes and an advanced smart-phone service, both of which could have tremendous impact in managing diabetes and other diseases. Winners of the competition were the Hass School of Business, University of California, Berkeley, and ESADE Business School-Universidad Ramon Llull in Barcelona, Spain. The developing world solution, from Berkeley, involved “2Vidas,” a pharmacy-based membership program for low- to middle-income pregnant women to address the growing problem of diabetes in Mexico. The project’s aim is to make a lasting health impact on two lives during a finite period in which women have increased motivation to take better case of themselves for the health of their babies. The program works by providing pregnant women access to monitoring tools at local pharmacies, support through peer-led sessions, and encouragement via positive SMS messaging that rewards self-management and offers health tips. The potential economic impact is the ability to save women 58-98% of out-of-pocket monitoring costs, depending on frequency of use, and the health system an average of $110 per enrolled women per year through improved diabetes control — lowering the risk profile of the mother’s pregnancy and the baby’s propensity for NCDs. 2Vidas membership program will deliver an estimated $10.4 million in systemic cost savings and $475,00 in added value creation over five years. Developed by the ESACE Business School-Universidad Ramon Llull, the Barcelona-based team’s effort, “Dr. Diabetes,” utilizes a handheld device with an application and two cloud servers. It is a total solution designed to provide diabetes awareness, monitoring, and management to patients with chronic illness, initially for China. It also provides early awareness to the public and streamlines diabetes management for patients. The solution provides medical data via cloud computing to physicians for accurate diagnosis, and to pharmaceutical companies and hospitals for efficient research and development. The solution is designed to be scalable to support other NCDs. It is designed to lower the risk of complications, decrease treatment costs to patients by up to 73%, and decrease their hospital visits by 65%. Winning teams were recognized this week during the NCD Awards Ceremony at IBM headquarters in Armonk, NY, and Novartis headquarters in East Hanover, New Jersey. People interested in learning more and in joining the conversation on the topic of fighting non-communicable diseases can do so in the People for a Smarter Planet on Facebook, and via Twitter at #NCD. They can also join in the “Smarter Healthcare” group on LinkedIn. When it comes to being an entrepreneur, IBM’s general manager for its Watson Solutions group has been there, done that, and got the t-shirt. Twice. IBM Watson GM Manoj Saxena explains to the IBM SmartCamp finalists the commercial opportunity IBM's Watson technology presents to the world, even as he shares his own unique experiences as an entrepreneur. When Manoj hit the stage at this afternoon’s IBM SmartCamp Global Finals in San Francisco to explain why he’s back at a big company like IBM, he started with his own start in mind. Though he’s been with IBM for five years, and had an early background in corporate America at 3M, he started his own company in 1998 (Exterprise), which was acquired in 2001 before he started another company, Webify, which was later acquired by IBM. Manoj explained how startup culture and reality has changed dramatically from the dot com boom to present times. In the past, you would build it and they would come, and it was all about eyeballs, traffic, and the amount of money raised as a badge of honor. Today, if they come, you can then go build it, but you’d be well advised to validate THEN scale, and that actual revenues are the path to profitability. Moreover, it’s advisable to take as little money up front as possible, so that you can focus on building value, a business, and not just a startup. Ultimately, Manoj explained, companies are bought, not sold, and if you focus on building a business around a greater purpose, the riches will come. He then turned to Watson, and the role the Watson technology is playing as IBM works to build a smarter planet. Watson, Manoj explained, was a part of an IBM research project that followed in the spirit of the Deep Blue/Kasparov chess match of 1997, but that this time around, more focus was put on the commercialization of the technology. 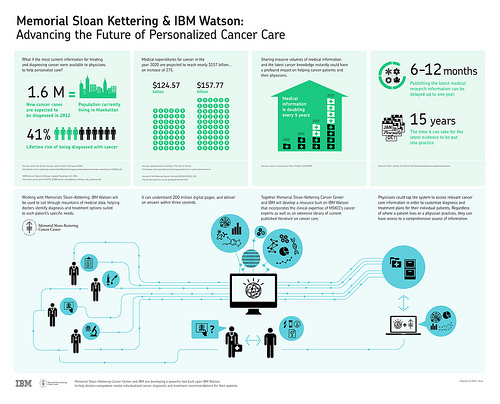 So, Watson has been geared towards some select industries initially, namely healthcare and financial services, with others yet to come. On the healthcare front, Manoj revealed some startling statistics. One in five diagnoses today are estimated to be inaccurate or incomplete, and there are 1.5 million errors in the way medication are prescribed, delivered, and taken in the U.S. alone each year. And yet 81% of physicians report spending five hours or less per month reading medical journals, even as medical information doubles every five years. Which is where Dr. Watson’s technology can help doctors with their diagnoses. Not to replace doctors, but to help them winnow down to the most likely diagnosis based on Watson’s ability to rapidly analyze millions of likely scenarios and generate and evaluate those hypotheses to identify the “best” outcome. As Manoj suggested, think of it as a navigation system for doctors. If you’ve ever wondered to yourself how you can get involved in and in support of IBM’s “Smarter Planet” initiative, the following provides just the kind of example to foot the bill. IBM and the University of Antioquia today announced a joint research project that will use computer power from IBM’s World Community Grid, which pools and uses the idle computing power of volunteers’ personal computers around the world to help accelerate scientific research that addresses humanitarian challenges. IBM and the University of Antioquia partner to use the World Community Grid computing power to search for smarter treatments of a common parasite. 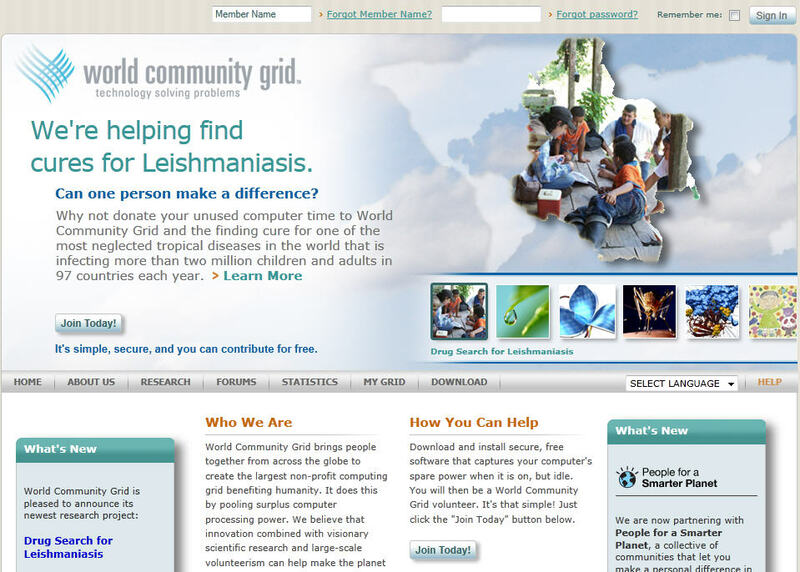 In this particular instance, IBM and the University of Antioquia will be using the World Community Grid computing power to predict potential inhibitors or drugs that have the potential to control Leishmaniasis. The research project will try to find potential inhibitors of the Leishmaniasis parasite, or explore the application of drugs currently used to treat similar diseases. Using the computational power of World Community Grid enables the screening of 600,000 potentially useful chemical compounds stored in a public drug database. The idea is to virtually apply these compounds against 5,300 Leishmania proteins in an effort to identify prospective drug treatments. Instead of implementing costly and lengthy laboratory trials, or spending dozens of years performing computations on small computers, millions of experiments will be simulated using the software installed in the devices comprising World Community Grid. “Conducting this same project in a local cluster would take more or less 70 to 100 years. With World Community Grid, it will be completed in a maximum of two years. This is evidence of the data processing capacity of this network dedicated to provide computational resources to try to find a solution to the problems that besiege communities in need around the world, as is the case of Leishmaniasis,” said Carlos Muskus, Coordinator, Molecular and Computational Biology, PECET, and project leader. What In The World Is The World Community Grid? World Community Grid is a network of more than two million individual computers, providing donated computer power during the time in which their computers are idle, creating the world’s largest and fastest computing grid to benefit of humankind. World Community Grid is based on IT innovation, combined with scientific and visionary research, plus volunteer, collective and nonprofit actions to create a smarter planet. Individuals can donate their computers’ time to these projects by registering at www.worldcommunitygrid.org, and installing a secure, free software program in their personal computers running Linux, Microsoft Windows or Mac OS. Computers request data from the World Community Grid server when they are idle, or between key strokes during non compute-intensive jobs. In this way, they can help complete the protein computations required to perform the Leishmaniasis research in Colombia. Sponsored by IBM, World Community Grid has offered researchers worldwide the equivalent of millions of dollars’ worth of free computational power to enable medical, nutritional, energy and environmental research. At present, more than 548,310 users and 1,729,127 devices are part of IBM’s World Community Grid in 88 countries, including Colombia. World Community Grid’s server runs Berkeley Open Infrastructure for Network Computing (BOINC) software, maintained at Berkeley University and supported by the National Science Foundation. Projects undertaken by the World Community Grid, which have yielded dozens of peer-reviewed scientific research papers, include efforts to cure muscular dystrophy and cancer, as well as to develop cheaper and more efficient solar cells. Other projects include Fight AIDS@Home with Scripps Research Institute, which found two compounds that may lead to new treatments of drug-resistant HIV strains. The Nutritious Rice for the World project completed 12 million computational transactions in 11,000 computing hours, in an effort to achieve healthier, more disease and weather-resistant rice strains. And the Genome Comparison project run by Fiocruz has organized and standardized the way scientists understand the role of gene sequences in maintaining health or causing illness. Go here to learn more about IBM’s corporate citizenship initiatives. My good buddy Scott Laningham from developerWorks recently conducted a Q&A with IBM Rational software guru Grady Booch. You can check it out in the video down at the bottom of this post. He also talked to the “hat lady.” I’m not going to explain who the “hat lady” is. If you don’t know who she is, you can find out via the video! 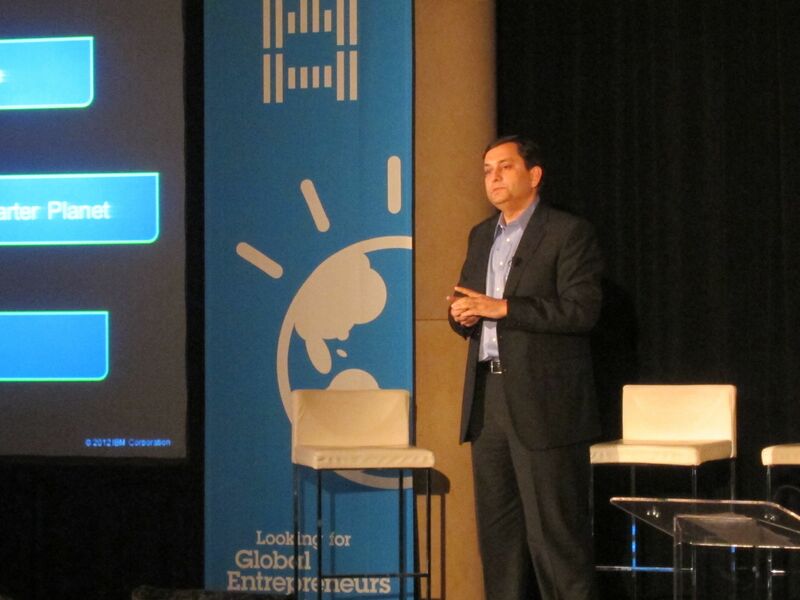 And FYI, Booch is going to be doing a keynote at Innovate 2011 about the Watson technology (remember Watson V. Jeopardy!, where the computer won back in February??). Booch is going to go deep on the subject from the Innovate stage in Orlando. You can learn more in Scott’s interview. Speaking of Watson, as we head into a long holiday weekend here in the U.S., let it be known that IBM announced earlier today the expansion of its Health Analytics Solution Center in Dallas, Texas. Some background: Since opening in Big D in late 2009, the HASC has worked with more than 150 hospitals, health plans, and other healthcare organizations to drive smarter healthcare. It provides clients access to health analytics experts, tech architects, and specialists, as well as to hundreds of health industry experts from across IBM. As part of HASC’s expansion, the center is incorporating some of the same technology used in IBM’s Watson. Using sophisticated analytics to understand the meaning and context of medical information, advanced health analytics is increasingly being used to help healthcare orgs gain new insight from the explosion of health data growing at the rate of 35 percent per year! You can learn more about this new expansion here, and about IBM’s smarter healthcare initatives here. In the meantime, have a great, long, restful holiday weekend, and please, for those of you in the American family, don’t forget to remember those who have given their lives in the service of this country. Puppies and babies. You just can never go wrong with puppies and babies. Once upon a time I worked on IBM’s corporate marketing team handling our Internet advertising, and as much of an Internet geek as I was, I always loved our television spots. But a new spot made in partnership with Ogilvy and Mather and Motion Theory simply takes one’s breath away. Entitled simply “Data Baby,” the new 30 second spot uses a combination of live action (babies!) and “generative art” to demonstrate the data opportunity presented in monitoring a newborn’s vital signs. In turn, the visualization helps demonstrate how IBM technologies help analyze data to make for smarter healthcare. Me, I just want to tickle the little baby! Cootchy cootchy coo! The story behind the story makes pivot tables seem primative by comparison. And, in fact, no spreadsheets were harmed in the making of this TV spot…babies, either. To pull off the visuals, the team built custom code to translate spreadsheets of raw data derived from a newborn’s respiratory, heart rate, blood pressure, EKG oxygen saturation, and temperature readings into “motion paths,” paths which move and evolve design elements organically across image sequences. Yeah yeah…look at the cute little baby…cootchy cootchy coo! Enough of my description — watch the spot and see for yourself. I got to hear about the story behind the story last October at the IBM Information on Demand event when we heard directly from an Australian researcher who partnered with IBM Research to help investigate this “stream computing” opportunity. The techniques being developed have the potential to save young lives around the globe, and in the process help the medical profession get smarter about treating and preventing infant death syndrome and other infant-related medical problems. Of course, the data and visualizations are one source of inputs. But there’s nothing like hearing from the youngsters directly themselves as to what they thought of the commercial-making experience.